We've always said that the best part of blogging is all the AMAZING people we have met. This still rings true! In fact, we look forward to meeting bloggers at race weekends and always have great conversation. There is definitely a mutual respect. 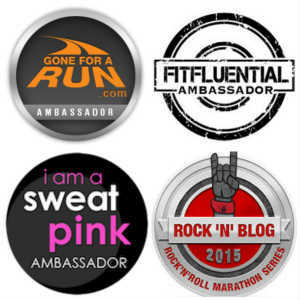 We're all runners, we're bloggers, and that's a bond we have. During our earlier days of running and blogging some of these conversations with other bloggers went quite differently. I probably would have been offended at some of these comments if I would have known better! So if you want to actually keep your running/blogging friends you might want to stay away from making these comments. 1. I NEVER read anyone's blog: One of the HUGE bloggers I once met at an event admitted in a room full of other bloggers and runners that she never reads other blogs. When I finally learned the extent of what blogging was all about I realized it was a give and take and sharing of ideas among bloggers. We were shocked that she would say this out loud. After further research it appears said blogger never responds back to any of her social media messages either. I often wonder how she became so huge when she neglected to interact with readers and followers? 2. It's on the blog: Another time I was engaged in conversation with one particular blogger (or at least I was trying to ). I asked her a question about a race she ran. Her reply was "Oh, it's on my blog". Later on I asked her about a recipe she was talking about. Again she said "Oh, it's on my blog". I heard her give that reply to several other people throughout the day. Gee, I wonder how she communicates with her real friends. Her Friend: So, what did you do this weekend? Her; It's on my blog. I suppose that is one way to ensure page views! 3. Wow, that IS slow: During a talk of a 5K race (mind you it was one of my first) I was asked what my goal time was. I said that I was kind of slow so I was hoping to come in at 30 minutes. This blogger replied "WOW, that IS slow". I was not offended because I know that I am not fast but I could not believe she said that out loud. And for the record, I ended up coming in at 29 minutes! ( I later went on to PR the 5K distance at 27 and some change). I wonder if she would still consider that slow? 4. With a blog name like that you are obviously not real runners: Since we've created our blog we've had some comments about our blog name. Some were negative but that's okay. We were told that with a name like Fairytales and Fitness, we were not "Real" Runners. I guess this blogger thinks we are just hobby joggers who lolly gag at races. Or maybe we were just meant to only do Disney races? Who knows. 5. Just plain old negativity: Comments #1-4 were comments that were made during actual conversations. We (like I am sure many other bloggers have) have had our share of negative comments left on the blog. I admit that since we have a pretty core group of bloggers commenting over the last year or so the negativity has gone away. The negative comments usually came from those who were not a regular reader. I understand that if we are putting stuff out there, it is free game for anyone to voice there opinion but we still think there ought to be some respect involved. Don't you? We feel comfortable writing this post because these comments happened a long time ago and these bloggers (who should rename nameless) would never read our blog anyway. In fact, I'm pretty sure they don't even know we exist. So please rest assure, we are NOT referring to you. You are correct. I think interaction is key! I think that's what makes blogging so fun! I can't believe some of those comments! Horrible. And now I'm super curious who #1 is! Some people are just rude. And one of the biggest bloggers I know goes around commenting. If she can find time for it, we all can. But to not even bother to try? Ugh. And to even admit it I think is worse. Wow, some people are horrible. I like the name of your blog! I agree that blogging is give and take. Once, I was out for an evening speed workout. As we were running to the 'start', I said something to the effect of: "We're not running the marathon pace yet, are we?" and someone in the group said, "Ha. Well, I guess this is marathon pace for SOME people." I was heartily offended. The implied insult to slower runners was palpable. I still regret that I didn't speak up. Great post! Thanks for sharing!! I love reading your blog/comments. I enjoy the race commentaries AZ I cannot run, only speed walk on good days (lol)!! 🌟 keep on blogging and sTay true to you. Thank you Cheryl! I'm actually going to try speed walking! It really bothers me when bloggers don't read other blogs and never reply to comments. I feel like that is such an important part of it! You don't have to rely to every single comment or read every blog, but if someone leaves a meaningful comment or asks a questions its nice to respond to it. Otherwise we feel like we are commenting and no one is reading! It was almost as if the blogger was bragging that she doesn't have to read other blogs! I know you told me the thinking behind your blog name and I think it is perfect! Luckily I have not had encounters like this with other bloggers. I will tell you something I am self conscious of. Sometimes, in REAL life, I'll start to tell someone a story that I had recently written about on my blog, and then I will pause and say "Oh wait did you read this on my blog?" Because I don't want to rehash something they already read about. But then I feel like a douche because I don't want it to come off like I think they SHOULD have read it already. I think your in real life friends will understand! The majority of our interaction with other bloggers has been good, but like you, we have heard some pretty surprising comments. When anyone comments on your speed, unless it is a compliment it is unkind. Glad we met you two, we've had fun seeing you both at races! The rest of our interactions with other bloggers have gone well too! We always enjoy seeing you too! I never comment on people's times because I know each race is such a personal experience. Wow, I can't believe some of those comments! I think the interaction is one of the best things about blogging :) It's so weird to me that someone would blog and then comment about how they don't read other blogs. I've always appreciate your interactions and commenting! I think that's the best part of blogging. I can't understand why anyone would choose not to do it. Rude comments are just tacky. Sometimes, you can't really tell -- because it's written and without hearing or seeing the person you can't judge how they meant it. Other times, it's very obviously snarky. I see blogging just like networking. It may not be in a professional sense, but it's the same concept. If someone is trying to get ideas out, they should also be listening to others. Blogging is a two way street and is all about give and take. To blog and then never go and read anybody else's blog is not just selfish, its just plain wrong. I've stopped reading a couple of bigger blogger's blogs for this very reason. interaction is so huge when building relationships. I've stopped visiting bloggers who don't reply to their comments. I find it rude. Why should I keep reading what you have to say and commenting on it only to bring you page views which you'll probably just turn around and use to get a sponsored post? Makes it seem like they don't care. I know runners by and large are a welcoming community but there is certainly a contingent that is judgmental. One of my biggest disappointments in the blogging world happened years ago when I was in CO for a race and met a very big blogger at the time. She was NOTHING like her online persona and barely cracked a smile and of course wanted nothing to do with us. Needless to say, I haven't been back to her blog since. Man, I love this. :) I hope that if anybody met me in person that I wouldn't be really different from my blog persona. I'm always praying that what comes out is genuine and real. I am stunned at some of the comments made by people! RIDICULOUS. Some people have no personal skills & I guess it flows through to their blogs. YIKES! I never speak to other bloggers and never leave comments because I'm simply too important to waste time with commoners --> that's basically the view of some folks which is NUTS! ugh, ugh ugh. Love you gals! Um...wow?? I have such an issue with other runners being mean and saying negative things like, "you're not real runners" and "you're slow." Please. If you put running shoes on, put one foot in front of the other and try your best, that makes you a real runner. And telling someone else they're slow is just rude. I actually had that happen to me during a race when a friend was passing me and, when he realized it was me that he was passing, he said, "Wow you got fast." WTF? Thanks, I think. Whatever. It's just insecure people putting other people down so they can feel better about themselves. Yea, I guess some people have no filter! Oh wow, this post is awesome. I love it. And I totally agree with everything you wrote. Running and blogging means different things to different people. I'm a slow runner (like I've NEVER had a 30 min 5k) but I'm still a runner. My blog is not that "professional" looking, I don't make money on it. I doubt anyone is learning anything from me. And that's okay. I blog because I like meeting new people and I enjoy writing completely random stuff. But I'm still a blogger. I'll be honest- I write the way I do because it's most true to who I am and I don't want to only read a list of someone's work outs for the week. I want to be entertained. I've loved your blog from the first time I read it and it's never occurred to me NOT to read it because of the name. 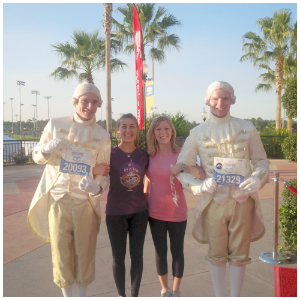 I like Disney races and clearly, so do you, hence the name. I'm not sure how the name would ever be grounds to say someone is not a real runner. Keep having an enjoyable blog and keep being the friendly girls you seem to be. One day I'll meet you guys in person! Thank you!!!! We are so glad you enjoy it! Wow. That's awful. I think it gies beyond being a good blogger. I think people like that need to work on being a good *person*! Negative people have no place in my world. You two and your blog are awesome, so they were probably just jealous anyway! Thanks Jennifer. Some of these comments were made to us before we even started blogging! I had a similar interaction with a big weight loss blogger/author years ago (this was via email, not in person) and although I really liked how she wrote, it definitely made me read her blog with less enthusiasm. My friends read my blog, and sometimes I'll check with them if they've read it before retelling a story, but otherwise, heck yes, I'll gladly rehash whatever I've written with someone in person! I swear, some people are just rude. I love the Disney recaps, especially because I've never run a Disney event. It's on my bucket list for sure! Of the bloggers who rely solely on their blog for their livelihood I think their mindset is not on community but on the bottom dollar. I love the rest of the normal people in the run blog world though! Thankfully I haven't met such rude bloggers so far. And thankfully I know they're in the minority, too. Geez, my fastest 5k is still 31+change. Yes, I do know I'm slow, but anyone that gets to know me knows I am trying my best to get faster! You know what? What goes around comes around. They'll get theirs! Wait. You mean you're NOT a hobby jogger who lolly gags at races?! Psshhht. I've been duped!! Hahaha jk. You know I love you girls AND your blog! these are good tips and things to keep in mind...bothers me for you that someone commented on you not being "real runners" because of something like your blog's name? what? i don't understand. people are so judgmental. and WRONG. jk jk. :) but seriously, good list, enjoyed reading this. I can always tell the people who don't read my blog by the comments they post. Hello? Stop! You could probably add 10 more to this list! Love you guys! i love this post! It is crazy to me how rude some people can be. as I like to say-a runner is anyone that runs. true runners are supportive of each other. wow! i can't believe how rude some people are! one of the reasons i love blogging is all the positive/helpful support. have i had a few negative comments? yes, but there are far far far more nice ones. also, i LOVE your guys' blog name! This was a really interesting read. I can't believe that you encountered those comments in actual conversation, how rude! Some bloggers really take themselves way TOO seriously. I agree some people are just rude! I realize sometimes it's easy to misjudge the emotion behind words but come on, rude is just rude. I am very glad I have not run into many negative comments. I'm sure I will at some point. I'm also glad you took this with a grain of salt and it did make for a great post today! Oh gosh, some people ARE rude. My tiny blog doesn't get a lot of traffic, but I LOVE the fact that I've interacted with my followers, and we support one another. I love your blog, and the name of it! #2...YES! That's my biggest blogging pet peeve!! Love the honesty in this post. I can't believe that you encountered these comments and are still here to blog about it. Shows how wrong they are. Congratulations for brushing them off and making it work for you. Our blog was not intended to turn into a running blog, but it's kind of morphed into it and our blog name definitely doesn't fit it. But really, it's just a place for us to write and provide motivation to workout. Thanks for this list. Hopefully it will make some serious rounds around the internet because it's an important reminder. YES YES YES YES YES on EVERYTHING in this post. Thank you for sharing a lot of the same thoughts that I've had during my blogging years! I am sorry that you've ever experienced interactions with such shallow bloggers. That is just awful. I've stopped reading certain blogs because they never respond to my comments or commented on my blog in return. I get very frustrated with bloggers who are so self-centered and don't realize blogging is a COMMUNITY!!! And a great community, at that!!! Oh my gosh to think that people can be so harsh - HOW RUDE! Yikes, can people really have such bad manners...? Boo! But you DO read sometimes and you do interact with other bloggers and that's what counts. Thanks for stopping by! I've stopped reading a few bloggers who never seem to read or comment on the blogs of others. The "It's on the blog" answer is another thing that drives me nuts. One Disney blogger is notorious for it. Someone will ask her where she got something that she's wearing or holding in an IG picture, and she invariably answers with, "Oh, just search my blog for it. I wrote a post about it a while ago." Yeah. No. If you can't be bothered to answer someone's question, there's really no reason for anyone to interact with you. A lady I work with daughter has a super popular blog because of TV shows that always reference to it. She also never reads other blog and never got into networking blogging because she gets over a few million page views each week. So one side I get it. But she slso turns her comments off its an info place not a community. But for all the others who are community bloggers I don't get why they would say things like this. I am also shocked someone actually replied to you "its on the blog" could you get any less personal. Someone did that to me I would just reply with. No thanks I don't really care I was just asking to be polite. Geeshhh some people! For those like us I think the networking and frienships built on it are one of the best parts. Others are just missing out. Great post ! Its true that blogging is such a give & take. I haven't had many negative comments, but maybe because my readership is very small ? I am doing a blog hop soon so we will see what happens ! Ja ja! I'm going to start telling my family and friends that "It's on the Blog"... kidding, I enjoy talking about running a lot! I'm new to this running and blogging thing, but I have learned that blogging is give and take. I enjoy reading other's race caps, especially for races that I know I will never do. But I guess the Mean Girls never left High School! I personal LOVE the name of your blog! and who cares how fast others run a mile! a mile is still a Mile at 5 minutes or at 10! Things that make my runs SO much easier! What I'll be doing in the Blizzard! That's a wrap!.....And Disney Race Outfits!